The Deering Goodtime Artisan Americana features a larger 12" rim, a Renaissance head, and an armrest. The larger 12" pot and Renaissance head give the banjo a deeper tone that is perfect for old time frailers or anyone looking for a banjo with a warmer tone. The Americana still has all of the features that have made the 100% USA made Goodtime models famous including a violin grade 3 ply Maple rim and a comfortable Maple neck. 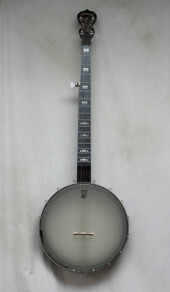 The new Artisan banjos feature pressure stained maple fingerboards with acrylic inlays, a dark walnut stain on the whole banjo, and also include traditional banjo planetary tuners and 5th string spikes installed at A, B, and C. We ordered this one with a scoop and a no knot tailpiece as well.